Three female job hunters, a large worker coalition and the American Civil Liberties Union lodged a legal complaint against Facebook on Tuesday, accusing the company of enabling discriminatory job postings with its ad-targeting tools. 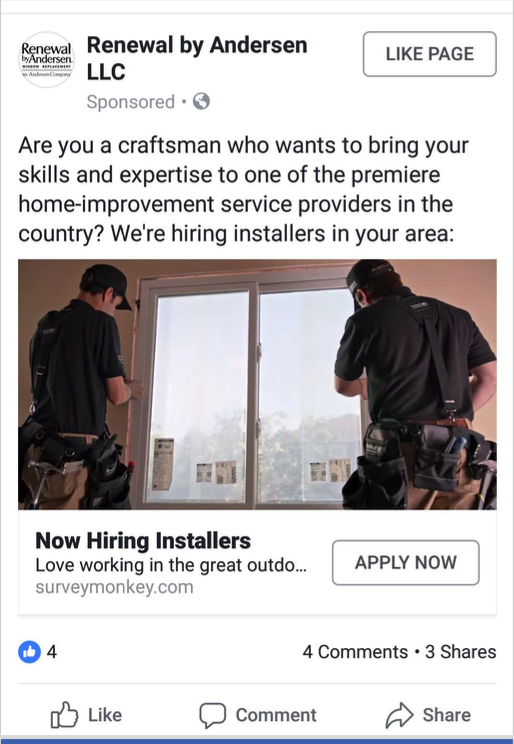 The complaint also targets 10 employers that used Facebook to post job ads — for roles as police officers, truck drivers and sales representatives at a sports store — that were exclusively targeted to men, according to images of ads in the complaint. The complaint with the federal Equal Employment Opportunity Commission is the latest of several legal efforts that take aim at Facebook’s core business of targeting advertising to highly tailored groups of consumers, a model that earned the company over $13 billion in revenue last quarter. The groups bringing the charges, including the 700,000-member Communications Workers of America union, argue that long-standing civil rights laws that protect people from discrimination are being routinely broken as more job and housing searches move online. Federal laws prohibit employers, lenders, insurers and landlords from excluding people from advertising on the basis of what are known as “protected categories,” which include gender, race, national origin, religion, age, military status, disability and sexual orientation. The practice of targeting online ads by demographics has become standard for nearly every Internet company that serves ads. But Facebook — the only tech company named in the suit — is more vulnerable to these accusations because its microtargeting capabilities go beyond those of its rivals and because the social network gives people the option to learn why they are seeing a particular ad. That “Why am I seeing this?” feature enabled the ACLU lawyers to bring the suit. To conduct the investigation, the ACLU and lawyers from the Washington law firm Outten & Golden had Facebook users indicate that they were interested in looking for a job by conducting searches on various job hunting websites and on the social network. The job ads from the 10 employers named in the complaint popped up in the news feeds of men but not women, the ACLU said. 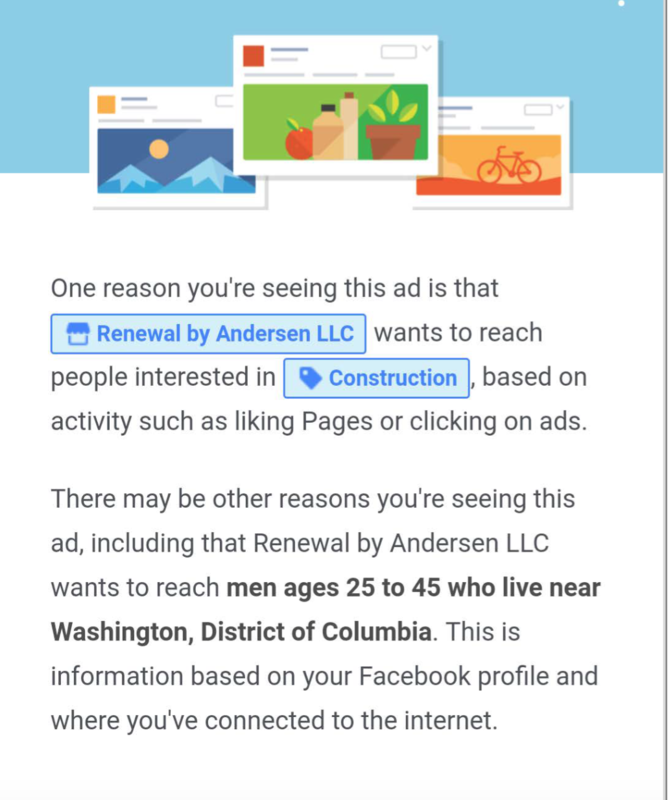 When the men clicked on Facebook’s “Why am I seeing this?” feature, they could see that the ads were targeted to them in part because of their gender. In March, fair housing groups filed a lawsuit in federal court in New York arguing that Facebook allowed landlords and real estate companies to illegally tailor their ads to discriminate against protected categories of people. In July, Facebook signed a settlement with the attorney general of Washington state in which the social network promised to build technology that would guarantee that ads for housing, employment, insurance and credit can’t be hidden from users of a particular national origin, military status, disability, religion or race — and the company said it would take responsibility if such ads were inappropriately targeted. Last year, Outten & Golden brought an EEOC complaint against several employers who had used Facebook to target ads that excluded older workers. That case is pending with the agency. If the agency certifies the complaint, the law firms plan to bring a case in federal court. If these legal actions prevail, they will represent another setback for Silicon Valley companies, which have historically been shielded from legal responsibility when actors abuse their services. Those decades-old protections, known as Section 230 of the Communications Decency Act, are being reevaluated by lawmakers and policymakers across the political spectrum. Online ad targeting effectively repeals protections that were put in place in the 1960s, when courts ruling on recently passed civil rights legislation decided that newspaper classified ads were not allowed to market employment opportunities to only one gender, said Galen Sherwin, senior staff attorney with the ACLU’s Women’s Rights Project. Elizabeth Dwoskin joined The Washington Post as Silicon Valley correspondent in 2016, becoming the paper's eyes and ears in the region and in the wider world of tech. Before that, she was the Wall Street Journal's first full-time beat reporter covering big data, artificial intelligence, and the impact of algorithms on people's lives.